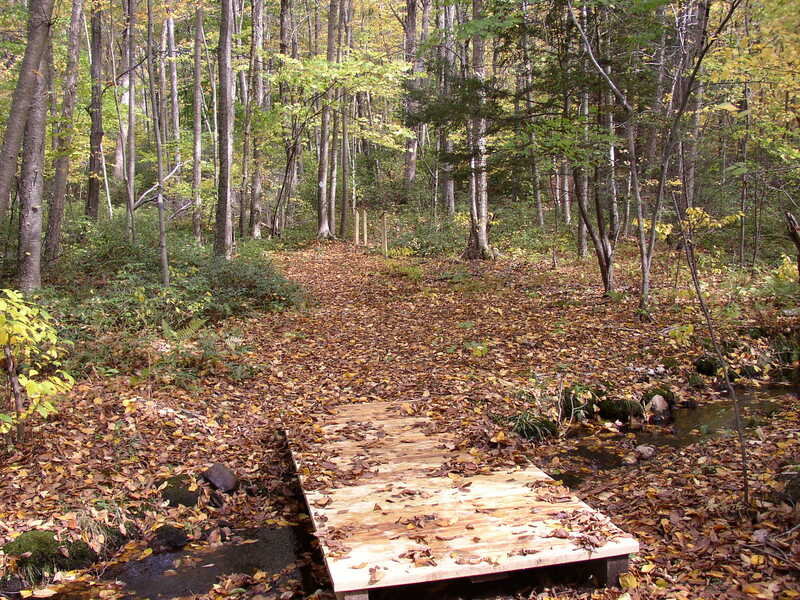 Forever Forest is 12 acres in size and is located on Whetstone Road about ¼ mile from RT 118. It was donated to the Harwinton Land Trust by Dr. Frances Holmes in 1994. She lived across the street from this property and wanted to have it remain as a natural area. It was a most generous donation to the Trust and a great benefit to the Town of Harwinton. Public parking is available for several vehicles on the gravel pull-off next to the Land Trust sign (see Forever Forest parking location). Although Forever Forest is only 12 acres, visitors will be surprised by how much it has to offer. The area has a scenic and interesting trail system (see Printable Map) that leads hikers along pretty marshes, over ledge promontories, and through distinct stands of hardwood trees and mountain laurel. 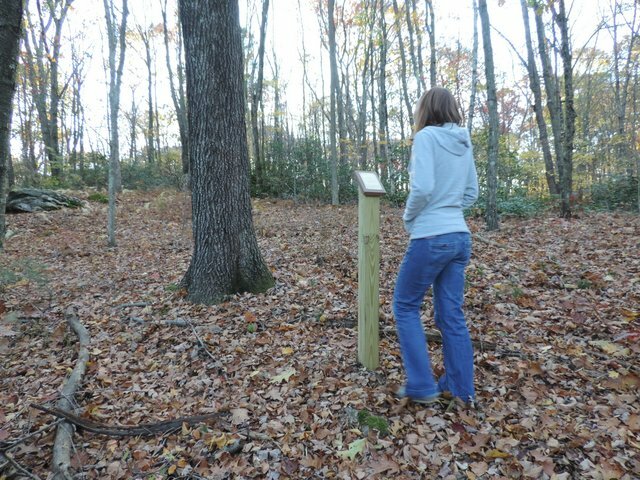 Hikers can review a map of the area just past the Land Trust sign. Please feel free to take a foldout guide from the map box. There are three geocaches hidden along the trails (see our Geocaching page for more information). The trails are well marked and are dry under normal weather conditions. All trails are relatively easy to walk, although there are a few hilly spots. 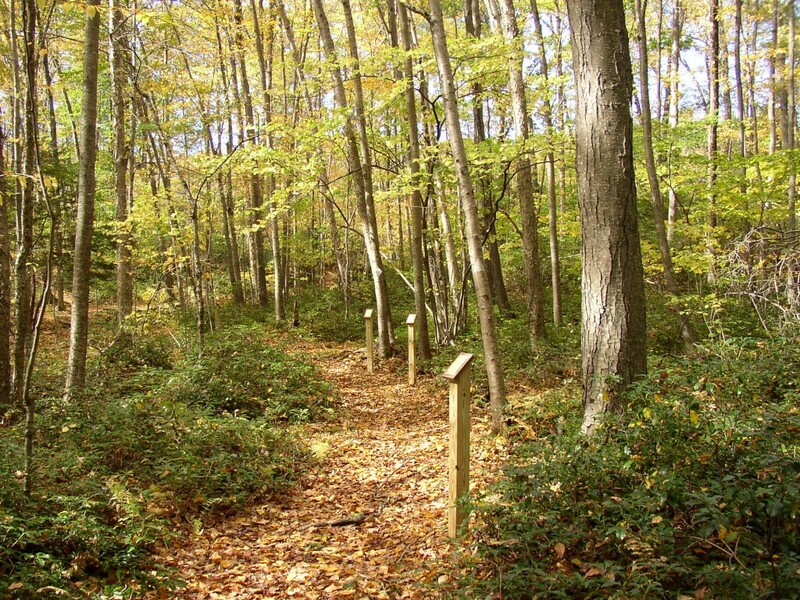 Two main trails allow hikers to head out to farthest end of the property and return on a different path. The yellow-marked trail is a little flatter than the white-marked trail. Shorter, red marked trails lead to the tops of ledge promontories, where hikers can get good views of the surroundings. 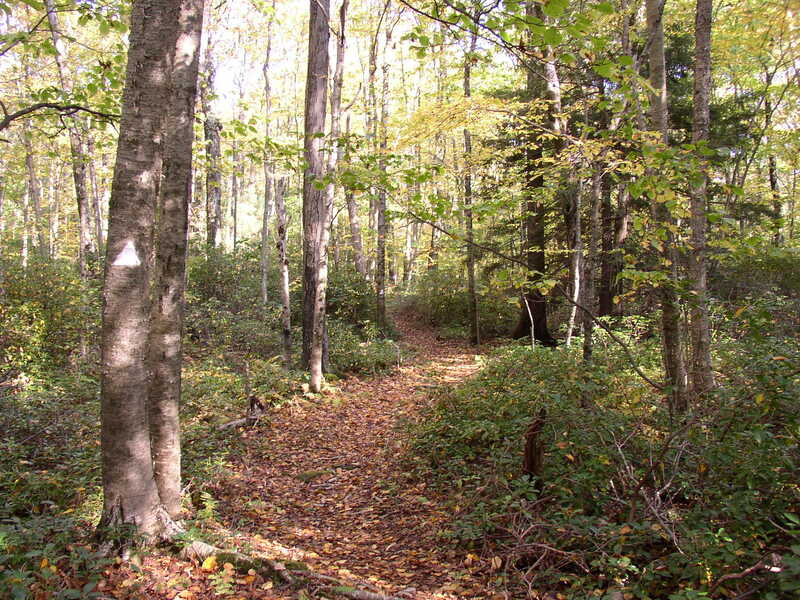 Trails are well maintained and easy to follow. Dogs on lease will be happy to visit. 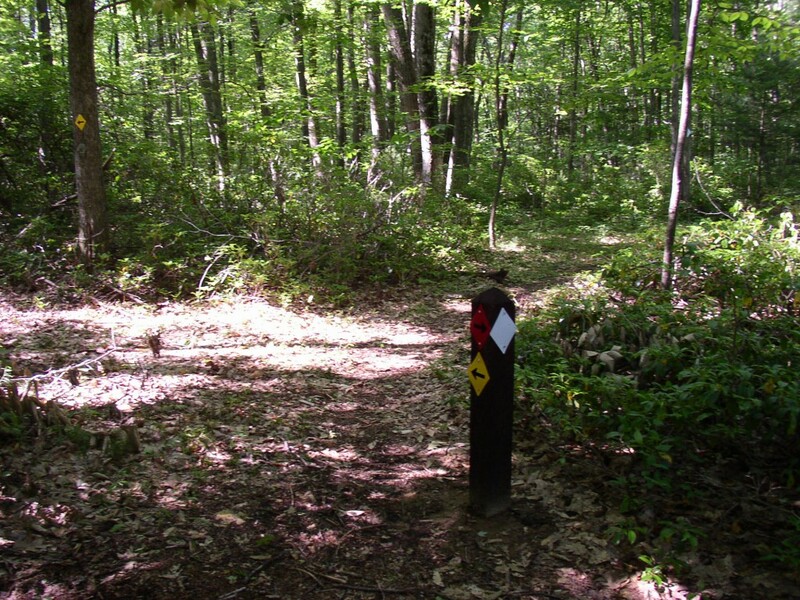 Trail intersections are posted with markers that lead hikers to where they want to go without confusion, even when up to three trails converge. 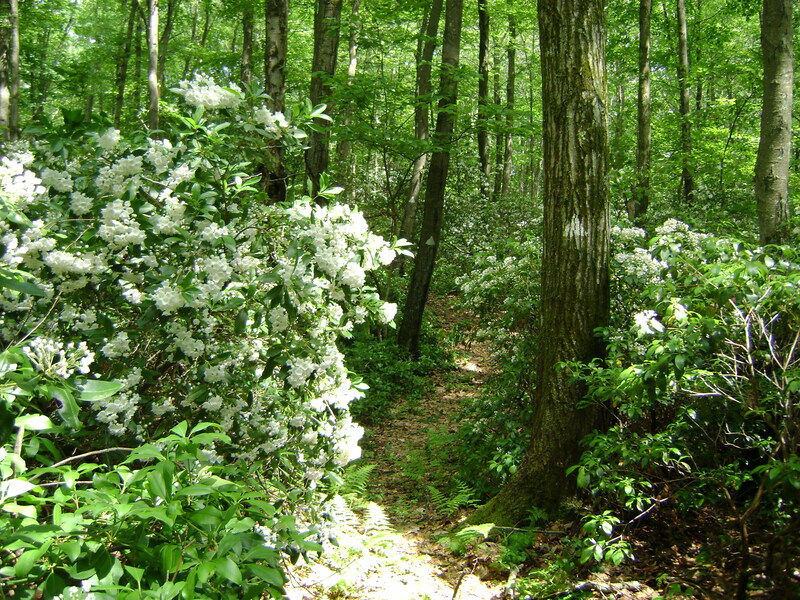 An especially good time to visit Forever Forest is in mid to late June, when the extensive stands of mountain laurel are in bloom. Winter is another good time to visit. 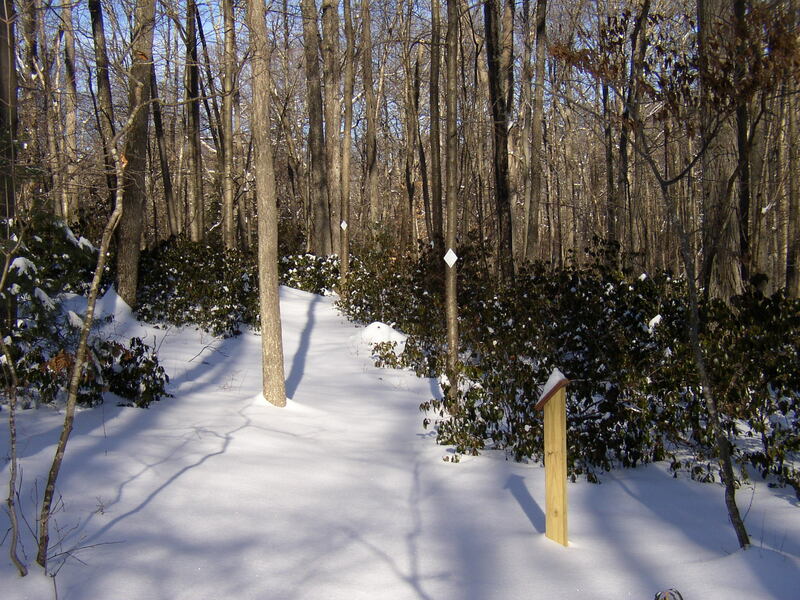 Mountain laurel provides plenty of greenery during the winter and the well-marked trails are easy to follow, even when they’re covered by snow. Forever Forest is a perfect place to snow shoe. Trails lead to two pretty marshes. You can see the smaller marsh about half way to the trail’s end. The larger marsh can be seen at the trail’s end. 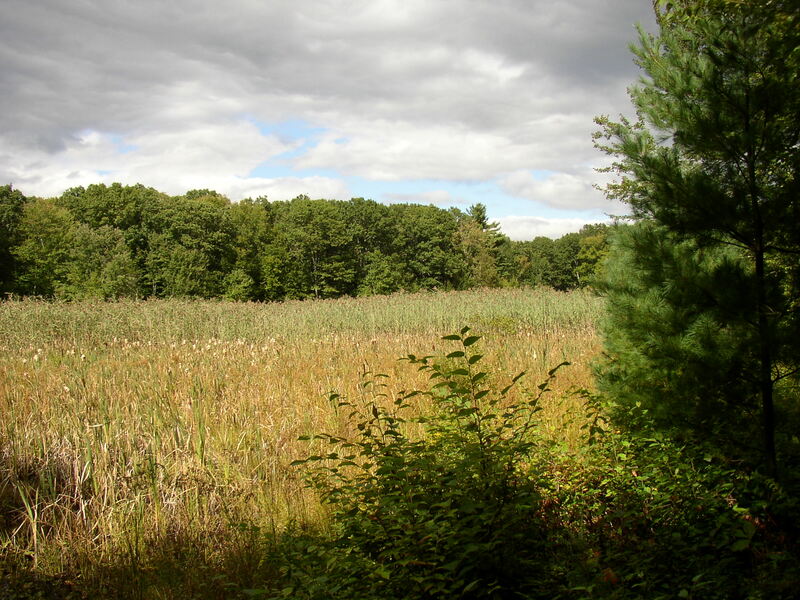 The marsh was a shallow pond at one time, before small earthen berms gradually eroded away. 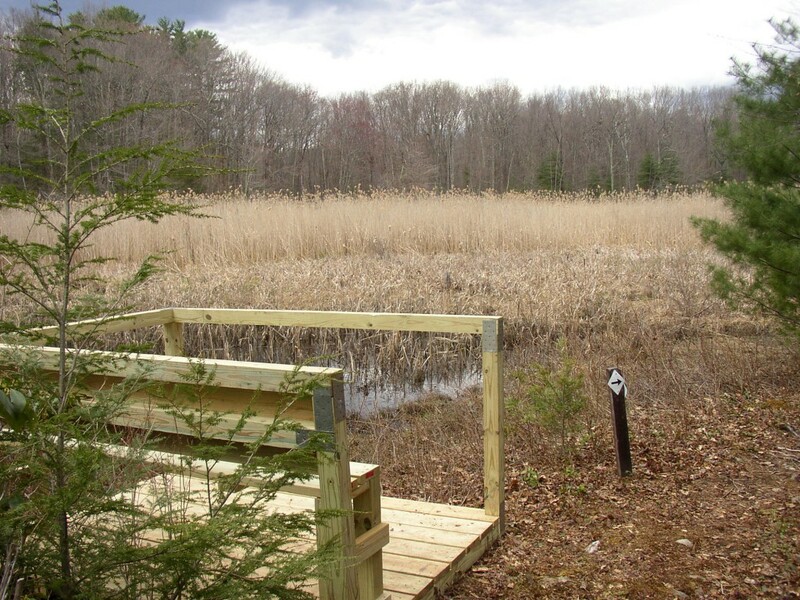 While at the large marsh, you can sit at the observation deck to take in the scenery and perhaps get to enjoy a chorus of red winged blackbirds. As you walk over the footbridge of the small stream (Kelly Pond Brook) flowing out of the large marsh, you’ll notice that the bottom of the stream is covered with flat rocks. The rocks are probably the smooth sand stone (“blue stone”) that was once used to manufacture whetstones (stones used to sharpen knives). 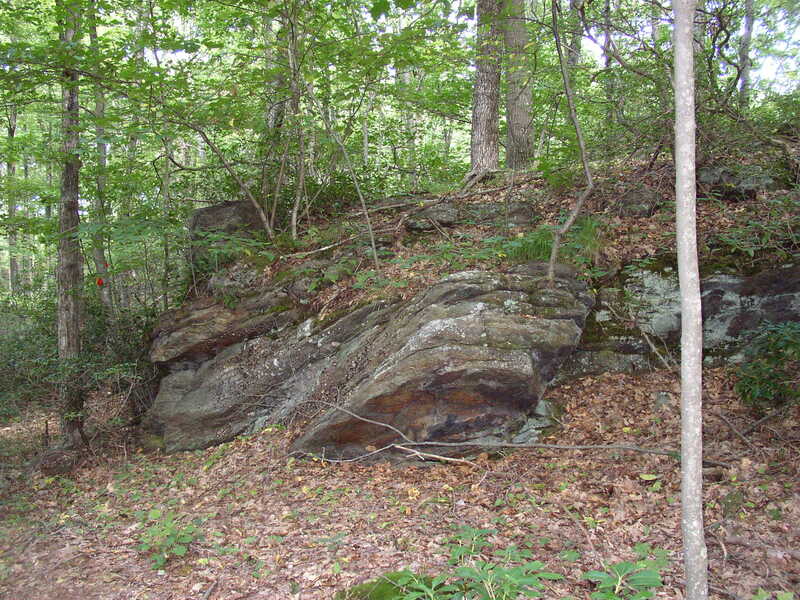 These rocks were exposed by the erosive action of the stream, and are a sign of the sand stone deposit buried below the ground’s surface. The area was noted for its manufacture of whetstones in the past. More information on this interesting history of Harwinton can be found in Ray Bentley’s History of Harwinton, pages 115-116. The main trails pass by ledge promontories. Shorter red trails pass over the top of them and provide good views of the surrounding terrain. Forever Forest has distinct stands of birch, hickory, and beech trees. 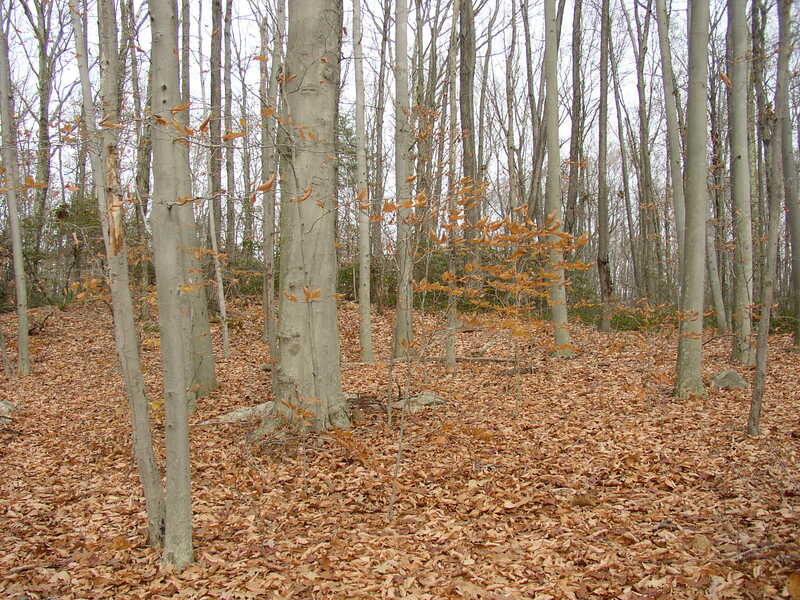 The stand of beech trees is very distinct and is located on the yellow trail. Beech trees can be easily spotted by the smooth bark and gold-colored leaves that remain on the trees for most of the winter. The larger tree in the photo below has a marking on its bark that indicates it was treated by the Civilian Conservation Corps. for a disease affecting beech trees in CT back in the 1930s. That older tree may have been a parent tree to the smaller beech trees surrounding it. There are a total of 26 species of trees present at Forever Forest (see list below). This represents a high diversity of trees for such a relatively small piece of land. Because of the high diversity of trees, the Harwinton Land Trust saw that the area could be used for educational purposes. We have used the trail system to serve as a tree identification walk. 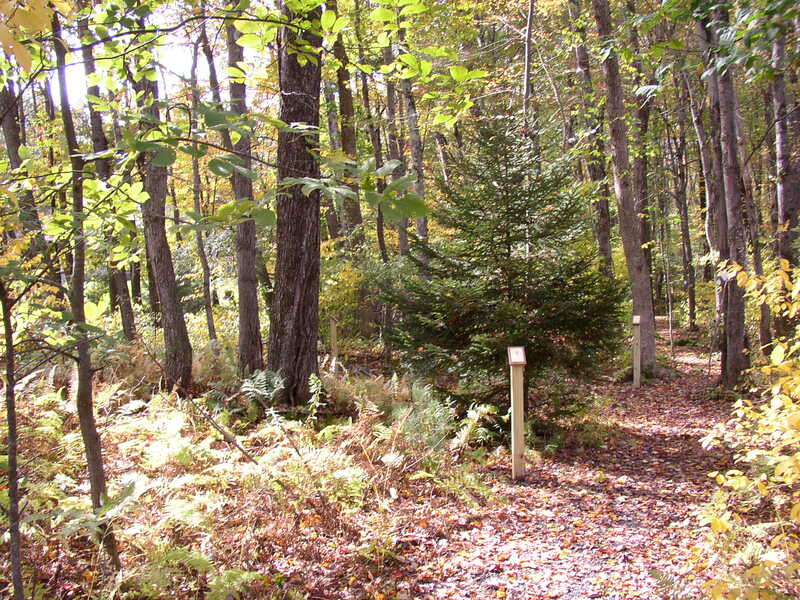 A representative specimen for each species of tree was located along the trails. Sign posts were placed at each of the specimen trees. 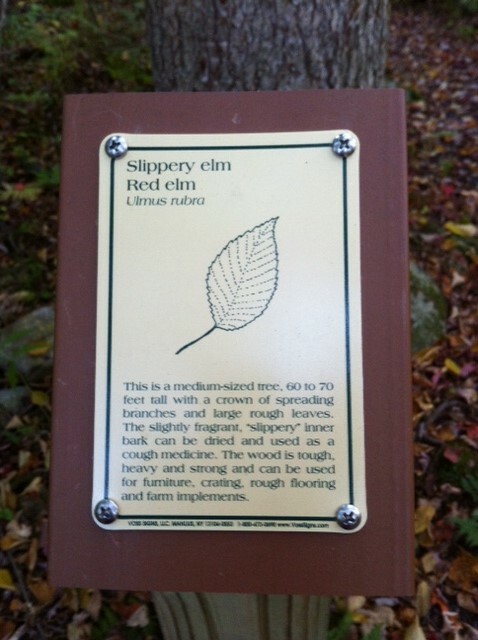 Each sign shows a diagram of the tree’s leaf and a description of the tree’s importance. Sign posts were placed next to similar species so that their finer characteristics could be more readily compared. Signs were also posted at young and mature specimens of the same species that have bark characteristics which change with age, such as yellow and black birch shown below. 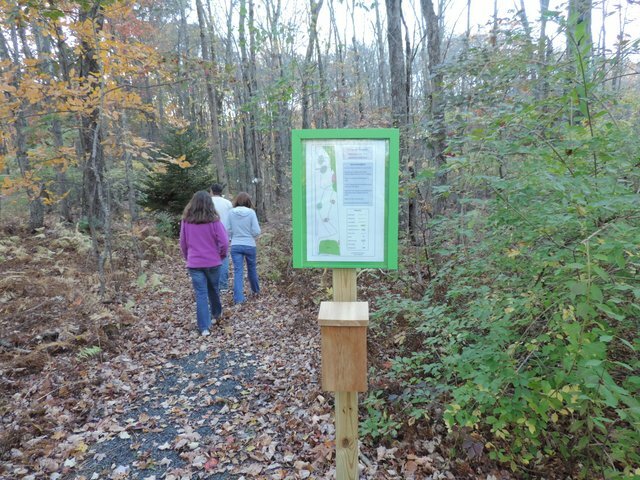 It is hoped that the tree identifications will help visitors become more knowledgeable about the trees in our area, and to gain a better appreciation of the town’s forestlands. The Trust created a Tree Identification Manual showing color photos of the leaves, bark, and seeds for each species of tree in Forever Forest. It should be helpful to anyone seeking a better knowledge of the species of trees found in Harwinton’s forestlands. Ryan Misani and Brian Hannon in 1999 for clearing a section of trail and installing benches for an Eagle Scout project. Town of Harwinton, Highway Dept. in 2005 for creating a pull-off for parking on Whetstone Drive and for providing surplus stone for trail improvement. CT Forestry Division in 2013 for identifying specimen trees. 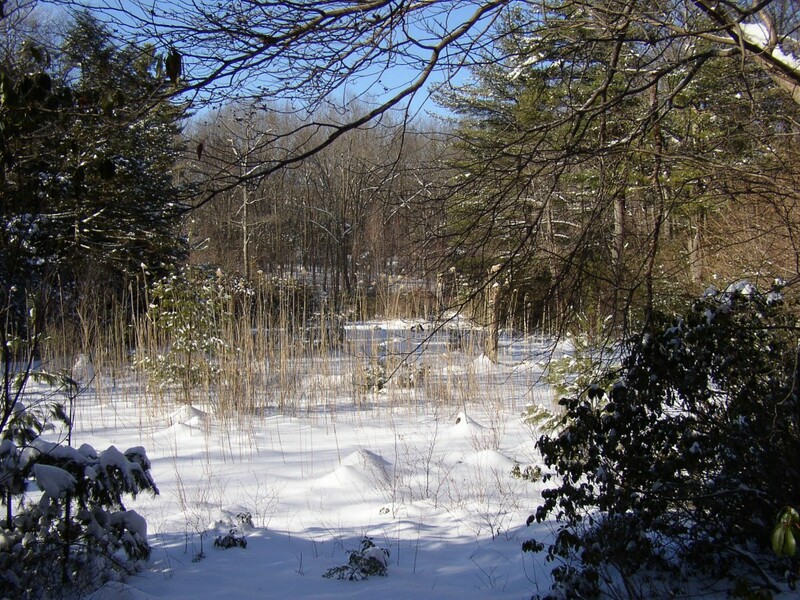 CT Wilderness School in 2014 for clearing vistas along the trails and in 2017 for helping restore water levels in the area’s marsh. Community Foundation of NW CT in 2014 for a grant to cover the cost of hemlock seedlings planted to provide a scenic buffer and shelter for song birds. 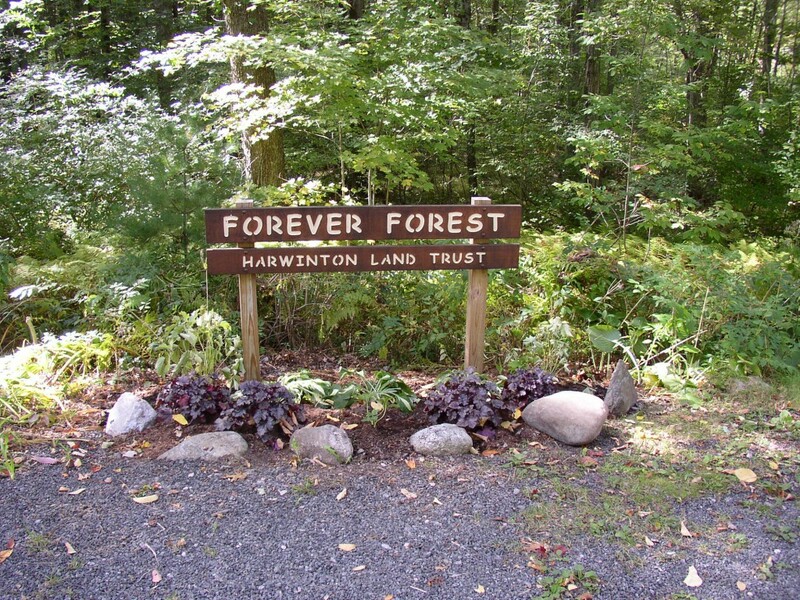 The Harwinton Garden Club in 2014 for creating a flower garden at the Forever Forest sign.